Moscow, USSR. 1930. The Pillar Hall of the State House of the Unions. A group of top rank economists and engineers is put on trial accused of plotting a coup d’etat against the Soviet government. It’s alleged that they made a secret pact with the French Prime Minister, Raymond Poincare, and with other Western political leaders, aiming to destroy the Soviet power, restore capitalism and break up the USSR. All charges are fabricated and the accused are forced to confess to the crimes they never committed. The court, presided by Andrey Vyshinsky, who later became known as the diabolical prosecutor, key-figure in Stalinist show trials and the advocate of mass repressions, delivers death verdicts. 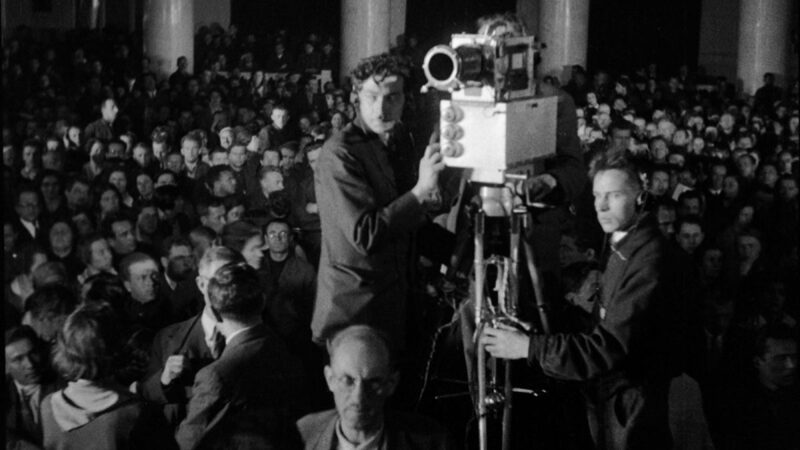 Unique archive footage reconstructs one of the first show trials, masterminded by Stalin, which unfolds as a theatrical performance with actors – prosecutors, witnesses, defendants, judges – lying to themselves, to the audience and to the world. The drama is real, but the story is fake. The film gives an unprecedented insight into the origins of a deadly regime, which made the slogan “Lie is Truth” its everyday reality. 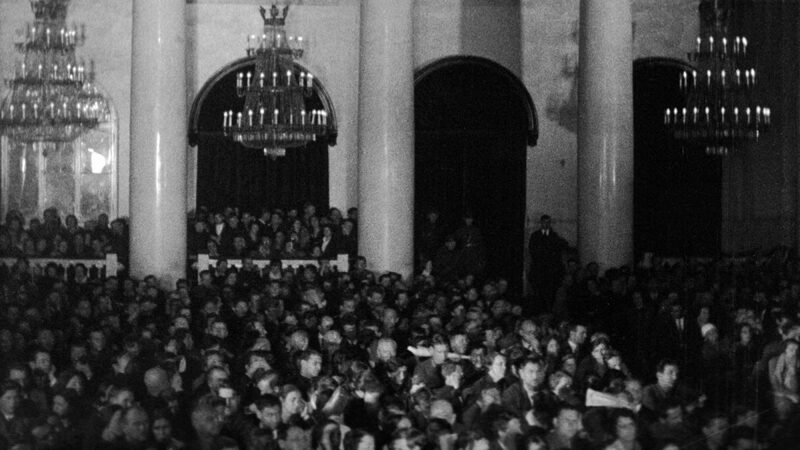 In the New Yorker: "An Extraordinary New Film Captures the Spectacle of Soviet Show Trials"
The show trial was a show. The Trial, a new film by the Ukrainian director Sergei Loznitsa, depicts it as a spectacle, complete with audience reactions, set in a stunning marble hall with grand crystal chandeliers. Loznitsa initially set out to create a compilation of documentary footage of Stalin-era show trials. He was already assembling the collection when his assistant discovered hours of footage of a trial from 1930. It was an extraordinary find: a rare Soviet technique had been used to record sound and image synchronously, directly on film. 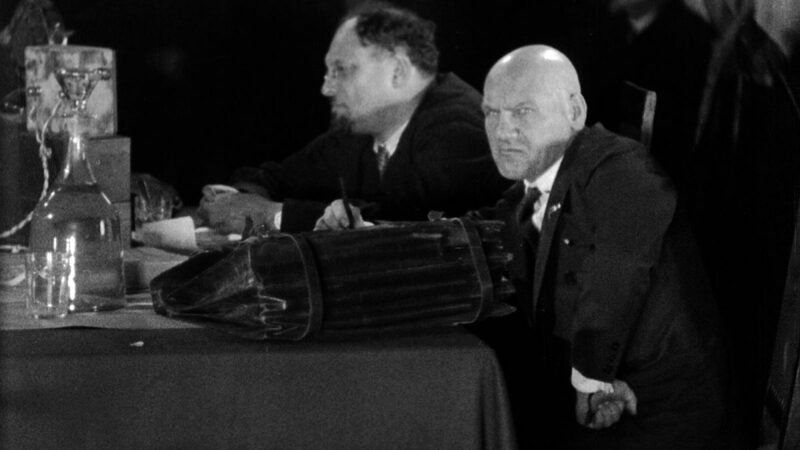 A single camera had been used to shoot the trial, in four-to-five-minute takes, often sweeping from the judges to the defendants to the audience. Originally, the footage had been used in a 42-minute propaganda film, intended to demonstrate that the state had no mercy for enemies of the people. With this footage in hand, Loznitsa changed course and decided to make a film about a single trial; his two-hour-and-eight-minute project, which uses only original footage with no commentary, is a remake of sorts. In the film, a bell announces that the show is about to begin. People are ushered into the Column Hall, an iconic Moscow space, which seats more than a thousand. The camera captures the audience and a large group of middle-aged men in suits, who are seated at cloth-covered tables dotted with bank lamps. It is a shock when some of these men approach the microphone to identify themselves and plead guilty—up until that moment, the men appear to be members of a single group. This is essentially accurate: the judges, the prosecutor, the court clerks, and the defendants are all members of the cast. They are performing their assigned roles. The rest of the people in the hall—men and women of different ages, some dressed in military uniforms and some in civilian suits, but all wearing their best—are the audience, and their job is to believe everything they see. Eight men are on trial. The youngest is 39, and the oldest is 66. All are either professors or high-level engineers. They stand accused of belonging to the Industrial Party, a sprawling organization whose goal was to sabotage Soviet industrial development and, ultimately, with the help of the French government and Russian émigrés abroad, to seize power. The Party and the plot were completely fictional. No such organization or effort ever existed. Remarkably, there is no real narrative of the imagined crime. Witnesses and defendants are confused about what they should be saying. At one point, a defendant claims that he was not a member of the Industrial Party. “You weren’t a member, you say?” the judge asks. “I didn’t realize I was a member,” the defendant offers. Groping for what he was expected to say, he asserts that he was working with French interventionists to overthrow the Soviet regime. A witness rambles—“Things didn’t go as planned. . . . The class struggle continued. . . . But it was weakened . . .”—until he talks himself into a confession, and admits to having been a part of a nonexistent plot. He proceeds to beg the court for mercy. Finally, the prosecutor, Nikolai Krylenko, gives a rambling speech with no details. The camera shows the defendants listening intently—for their own final statements, they are going to need whatever story he creates. But there is no story, only a mood, a sense that the Soviet state is under extreme threat and that enemies of the regime may be lurking anywhere. Only at the end of his speech does Krylenko go into an oratorical mode. His voice suddenly booms. His gestures become sweeping. He throws down the book he is holding. “Anyone in the U.S.S.R. who might aid in an effort to destroy the state must be swept away once and for all,” he says. “The state prosecution demands that the special session of the court sentence every single one of the accused to death by firing squad!” The hall erupts in applause. People stand up and shout. The audience turns into a mob. It is striking that the trial took place just thirteen years after the Bolshevik Revolution. All of the defendants would have been adults, even professionals, before the change of regime—they had not, it would seem, been shaped by totalitarianism. At the time of the trial, state terror had not yet been felt in the cities as strongly as in the countryside. This was the time before the purges, before the better-known show trials, during the year when the Gulag was just coming into existence. And yet everyone is dutifully playing his role. The defendants don’t defend themselves—indeed they cannot, because there are no specific accusations to deny. All they do is beg for mercy.